This is my sister Vera Coffey around the time of her First Holy Communion. 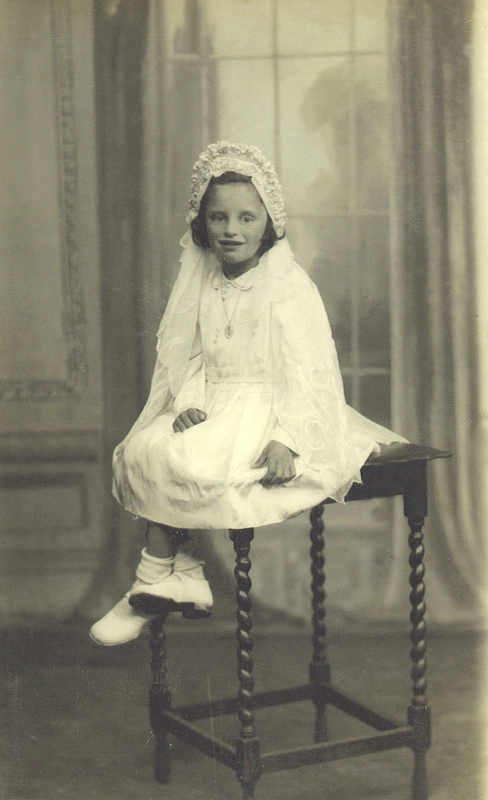 Like most young children from Cabra West Vera made her First Holy Communion in the convent chapel on Rathoath road. She was the first one in our family to make her Communion so the occasion was very special for my parents. It was an especially memorable time however for my grandmother who had lost a little girl named Veronica and whom my sister was named after. Isn’t it great all the same how names were carried down through generations in some families. The elderly woman who lived next door to us on Killala Road had worked as a seamstress in Arnott’s clothing department at a time when a lot of clothes were handmade and hand sewn. She offered to make the dress for my sister’s First Holy Communion. Now you have to keep in mind that this was the ‘Emergency Years’ of the 1940’s and everything was scarce including material for First Holy Communion dresses. The woman next door had a daughter who worked in a place on Mountjoy Square that made habits for dead people and also made the lining for the inside of coffins. One day she arrived home with a bundle of pure white silky off-cuts of coffin lining material. Well the next thing the Ma’ knew was my sister was sent for and measured up by the neighbour. And just like Cinderella on the night of her Ball a beautiful hand-made First Holy Communion dress appears almost out of the blue. My father and mother could hardly believe their eyes because not only was there a dress but a little handbag as well to match and all made from the lining for a coffin.